The vice president of Somaliland H.E Abdirahman Abdillahi Ismael (Sayli’i) attended a ceremony to celebrate the 88 anniversary of the Saudi Arabia monarchy held in Hargeisa. The function was occasioned by distinguished guests and Somaliland diaspora community from the kingdom of Saudi Arabia. The chairman of the opposition welfare and justice party Mr.Faisal Ali Warabe sent his congratulatory message to the Saudi government and her people on this auspice occasion to mark their 88 years as a monarchy. The minister of foreign affairs and international cooperation Mr.Sa’ad Ali Shire sent a special message of congratulation to the king of Saudi Arabia H.E King Salman Bin Abdiaziz Bin Saud and the heir to the throne H.E Mohammed Bin Salman Bin Abdiaziz Bin Saud. Speaking at the venue the deputy speaker of parliament Hon.Ahmed Yassin Sheikh Ali Ayanle congratulated the Saudi government at the same time said that Somaliland had shown the world that it is a country that can be trusted hence should be recognized by the international community. 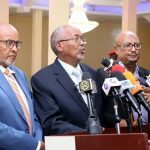 The deputy speaker thanked the Saudi government for the warm welcome the showed to the vice president of Somaliland during the just concluded pilgrimage whereby leaders from the Muslim world were invited by the king. 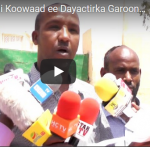 He urged the Saudi government to recognize the Somaliland passport as a valid travel document. The vice president of Somaliland H.E Abdirahman Sayli’I sent congratulations to the king of Saudi Arabia H.E King Salman Bin Abdiaziz Bin Saud and the crown prince Mohammed Bin Salman on the special occasion of 88 years of monarchy rule in Saudi Arabia. He said that the people of Somaliland and Saudi Arabia have a long history together and wished its people the best in their future endeavors.